Vextractor is a vectorizer program for transforming raster images into vector formats by building centerlines and outlines. This tool could be used for the vectorizing of charts, drawings, maps and schemes for input to CAD or GIS systems. You can also vectorize photo, logotypes and other line art images for use in Vector Graphic Design software. As soon as you see the conversion results, you will be able to tell, what is faster: edit the converted image in a vector editor or draw it by hand from a scratch. 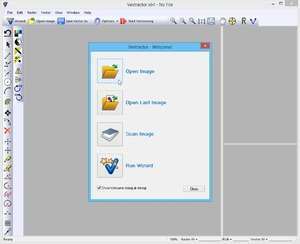 Vextractor 7.20 is a shareware program and can be used as a demo to try the software until the free trial period has ended. A full version of the program is available after the trial period ends. For security reasons, you should also check out the Vextractor download at LO4D.com which includes virus and malware tests. Additional screenshots of this application download may be available, too. Vextractor has a presence on social networks.